The Zildjian KCH390 K Custom Hybrid Box set puts some of the worlds most musical and versitile cymbals in one box, sonically matched, ready to play. 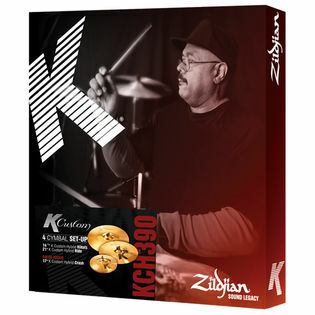 The K1224 14.25″ Hi-Hats capture the same sound as the existing 13.25″ models but with extra volume and more breadth of sound and feature the same “Hybrid Mastersound” hammering on the bottom cymbal. The 17″ K Custom K1217 Hybrid Crash was designed with Akira Jimbo to combine darkness and brilliance. Thin Crashes and Splashes to project like heavier cymbals due to the un-lathed bell. The 21″ K0999 Ride provides more projection and overtones than existing 20″ size.